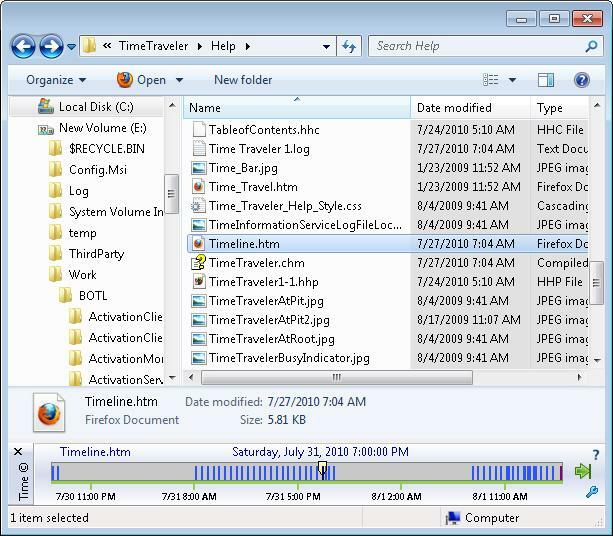 The TimeTraveler installation program restarts Windows Explorer and opens an Explorer window with your Documents folder. 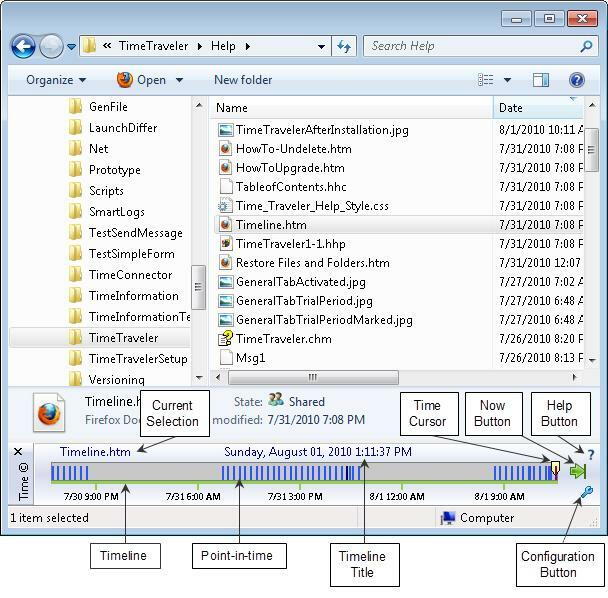 At this point, Explorer is configured to load the TimeTraveler Timeline automatically. You can change this behavior on the General Tab of the configuration window. The "business end" of TimeTraveler is its timeline, populated with time markers called points-in-time. Each point-in-time represents a file system snapshot for the explored drive. If the Explorer address is not referring to a fixed and local drive, TimeTraveler is not loaded. Similarly, TimeTraveler is not loaded for removable storage like CDs or DVDs, and for shared folders hosted by a remote machine. Snapshots which represent points-in-time are generated by Microsoft Volume Shadow Copy service. The timeline in its initial state ranges from the time of the first snapshot to the current time. The timeline is updated periodically and will display any newly created or deleted snapshots. You can trust TimeTraveler to accurately reflect the state of the explored drive. Further, the timeline offers a rich set of information and functionality. This path can be deciphered as follows: The turquoise portion is a folder created by TimeTraveler that serves as a mount point for shadow copies, or points-in-time. The yellow portion is a folder created to host sub-folders for the explored drive. The pink portion is a folder named after the GMT time of the point-in-time. Finally the green portion is the path being explored. From there, you are browsing the file system exactly as it was at the selected point-in-time as long as you stay within the folder C:\BearsOnTheLoose\F$\@GMT-2009.07.28-02.00.01. Note that if the current folder does not exist at time you select, Explorer will be set to the closest ancestor that existed prior to that time. When TimeTraveler is set on a point-in-time, the timeline title is fixed and only non-modifying operations are allowed on the files and folders. This is because the shadow copies are inherently read-only. You can't rewrite your history! However, you can use all the read-only operations provided by Windows Explorer and its adds-on, including Search. This makes TimeTraveler very powerful. Also notice in figure 2 that the right hand side of Windows Explorer has a gray background when navigating the history. This gives the user a visual clue that he or she is not looking at the current state of the file system. Just above the timeline, on the left, the name of the Explorer selection is displayed. It is the list view (Explorer right hand side) selection if it exists or the folder view (Explorer left hand side) selection otherwise. To the right of the timeline are the "now" and the configuration buttons. The former can be used to travel back to the current time when navigating the history. Pressing the latter brings up the Configuration form. Using this form and its graphical view of your storage, you can configure the storage associated with your shadow copies. You can also create, delete and schedule point-in-time creation. This form is explained in detail in the Configuration page. If you point at a time tick and press the right mouse button a short menu appears. It allows you to either: 1) Restore Windows 2) Restore a file or a folder 3) Compare the Explorer selection with the current time, or 4) Select the point for comparison with another time. You can see a full explanation of these actions in the "How To" section of Help.